PRODUCT DESCRIPTION: Small pellets in a shaker designed jar for easy application. The pellets are formulated so most ants love it to death. 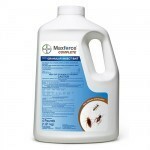 TARGET PESTS: All ants as well as roaches and crickets. WHERE TO USE IT: Outside the home in mulch piles and turf. RATE OF APPLICATION: One ounce will treat up to 1800 sq/ft. Generally, you will use around 4 ounces when applying around the home. Expect to retreat every 2-3 months. Try to treat a band around the home which is 5 to 10 feet out. Do this all the way around the home so foraging ants are sure to find some before they try to get inside. This stuff is amazing. First, you break the seal, replace the lid and shake the granules while walking around your house; it's just like shaking Parmesan cheese. Then you wait a day or two, and, viola, no more crickets. Really, for us, it was that easy. We've had to use this once before a few years ago and the residual effect lasted a long time. 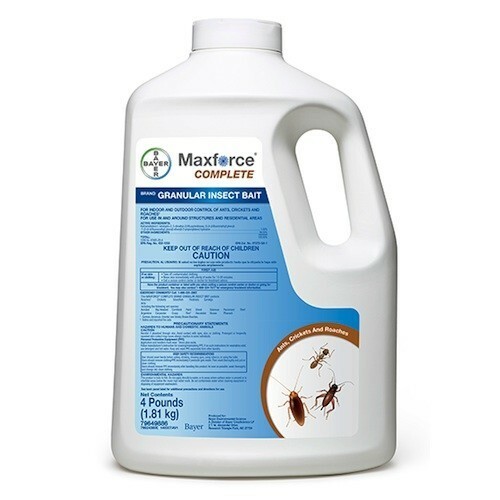 Furthermore, this is the first time I've used an insect control and didn't feel like I had to go through some decontamination chamber after using it. 10 years ago carpenter ants where devouring our house, actually eating it up. Used max force and haven't had any problems since. Great stuff. Just shake it out around our house and let the ants pick it up and take it back to the nest. The ants in the nest eat it and they all die. This product works. I have been using for 20 years. It really works. Many years ago I called a exterminator for a carpenter ant problem. 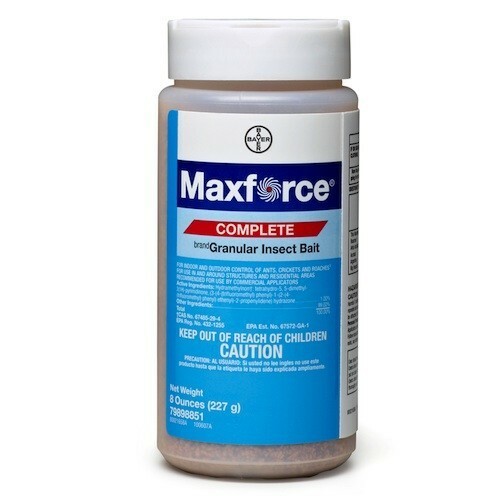 He went around the house and tossed a half capful of Maxforce granules against the base of house every 6-8 feet or so. Never had to call him again – I do it myself and save $$$ – this stuff, along with Maxforce gel, WORKS! The product is effective. The dispenser lid is pretty useless in the humidity of the deep south largely because it seems to clump behind the holes. So in the 4# jug you have to be very careful putting the granules down using the wide open mouth half of the lid. It lends to pouring out much more than you need. You folks need to marry the pour lids of the smaller cylinder size with the 4# jug for that to be cost effective. The product is still the best barrier for keeping bugs outside the home I've ever used in 25 yrs of homeownership.